These ISIS savages are killers. 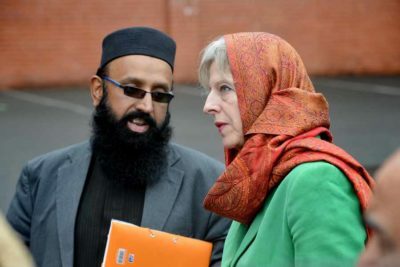 The British establishment is not so much naive as so totally sold out to the Muslims in Britain that the British government is terrified of offending Britain’s large and restive Muslim community by doing anything about these jihadis. And they will pay for their complacency and dhimmitude when these returning ISIS jihadis get back to the jihad, this time in the UK. This is the Britain of David Cameron and Theresa May. They banned me from entering the country, along with other foes of jihad, but these returning jihadis are welcome and able to roam free. It’s national suicide. While the British government has stripped 19-year-old Shamima Begum of her citizenship in a bid to prevent her from returning to the United Kingdom, Breitbart London has previously reported how a large number of extremists have already arrived — and continue to arrive — from foreign warzones. Despite assurances from the police that those returning will be subjected to Terrorism Prevention and Investigation Measures (TPIMs), a report by British newspaper The Times reports that only a small minority are actually monitored in this way. Nikita Malik of the Henry Jackson Society told the paper that, due at least in part to the great expense of putting TPIMs in place, only a small number have actually been activated, speaking of only a “handful” of the estimated 400 returned fighters and extremists being subjected to them. “The rest have been put under surveillance. TPIMs are for the highest level because they are so costly,” Malik explained. The report revealed Home Office figures showing nearly £5 million had been spent controlling just 23 individuals, with legal bills of £1 million a year and accommodation costs of £70,000 a year per individual. Other costs, including tagging suspects, travel costs, and policing to enforce restrictions, are counted separately, piling up on top of the Home Office figures. The government disputes the claims of the Henry Jackson Society, and insists the use of TPIMs is not considered on cost grounds. These figures come just weeks after separate revelations reported by Breitbart London on the monitoring of terror returnees uncovered by Labour MP John Woodcock. Speaking in Parliament, Mr Woodcock said: “Are more than 400 of those returning individuals in jail or going through the court system? We simply do not know, because the Government will not release the figures, despite repeated requests.